Don't let your assets get caught in the court system when you pass on. Speak with our attorneys about creating an estate plan. Count on the Law Office Of Eric W. Johnson to stand up to the creditors and get them to stop hounding you. No matter how complex the legal and financial issues associated with your estate plan or your current finial situation, you can count on the bankruptcy and estate planning attorneys at the Law Office Of Eric W. Johnson. Based in Chula Vista, California, and providing services for more than 10 years, we provide sound legal advice in the areas of civil litigation, estate planning, and bankruptcy. When you come to our office, you meet directly with an attorney and not a paralegal or assistant. We take the time to get to know you on a personal level so that we can provide expert advice tailored to your situation. 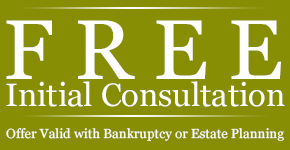 for expert legal advice regarding your estate or financial circumstance.